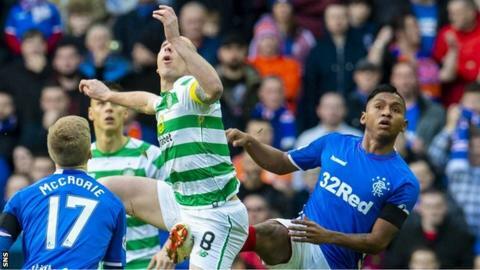 Rangers striker Alfredo Morelos will face no disciplinary action for his behaviour against Celtic. Morelos appeared to aim a kick at Scott Brown, caught Anthony Ralston with his studs and seemed to grab at Ryan Christie as Rangers won 1-0 at Ibrox. But all three incidents were seen in their entirety by match referee John Beaton so no retrospective action can take place on this basis. Rangers next play Cowdenbeath in the Scottish Cup on 18 January. They return to Scottish Premiership action five days later away to Kilmarnock. Can Gerrard tame Rangers' El Buffalo? In cases of unseen offences of serious foul play and violent conduct, the match referee is no longer asked to provide a statement of opinion. Instead Scottish FA compliance officer Clare Whyte asks a three-person panel of former referees to review whether a sending-off offence occurred. Only where all three individuals agree that it did will a notice of complaint be raised. The individual will then have a set period of time to either appeal against or accept the charge.